I was at the store the other day and I saw a promotion where if you buy a salad, you get a free Sambazon juice. 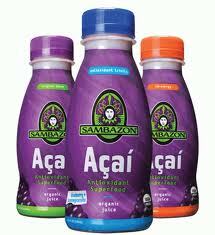 Sambazon is one of these healthy juice blend drinks that has acai berry. I had never tired it before and since the regular price was $3.50 for a 10oz bottle, I thought I would give it a whirl. They have many varieties but I decided to go with the strawberry banana. It's 100% juice and omega 3 6 and 9. According to the date, the shelf life is about 2 months which is not bad. As for the price, I would never pay $3.50 for a single serving of juice. I wish these fresh juice smoothies for more affordable. The cheapest ones are like $2.50. So how did it taste? Very good! It was like a cross between a juice and a smoothie. Not heavy like a smoothie, but fuller than a juice. It had a fresh taste to it and had a banana flavor mixed with berry. There was a little bit of a grit to the texture, but that is to be expected from a blend like this. Overall I was very pleased with the product. Unfortunately, the cost is out of my price range so the only time I would get it again would be another free promotion or a big discount. With comedy traditionally being considered a male dominated genre, it's always nice to find funny, creative women excelling in this area. I recently discovered a couple of talented girls on Youtube named Anglea Trimbur and Wendy McColm. I found Angela through Kyle's channel (check him out too, he is hilarious). She performed a song as "Juli Diamond" called Club North Pole. I thought it was great so I did some research and found her channel. Here is one of her videos where she and her friends have a thing for young guys... really young guys. After checking out some of Angela's videos, I found Wendy McColm. She also has a channel and has written, directed, and acted in many videos. She makes odd videos with a quirky sense of humor that will either leave you laughing or asking yourself, "What did I just watch?" Here is one where she pays tribute to the Back To The Future series. Here is one more channel to check out that features both of these ladies as well as a few more funny women, it's called These Girls. It again has an off beat sense of humor that your will either love or hate. In this video, they are at a party and they see a guy they like named Dave. If you liked these videos be sure to check out their channels for a lot more entertaining videos.